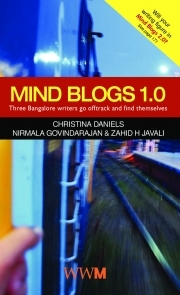 Description of "Mind Blogs 1.0 (eBook)"
Sunshine, rain, bombs, bridges, mothers, friends, bikes, distances ---- sorrow, joy, hope, love, celebration --- cheap thrills, poignant observations and an intense desire to make this world a better place, bind these pieces by three writers of diverse, yet conjoined personality. Laugh, cry, reach out… and savour those small, many times unnoticed moments through the experiences of these writers. Mind Blogs 1.0 --- a collection of heartfelt ramblings from Bangalore. The fly continues to sit on the wall. Author of the novel Ginger Soda Lemon Pop CHRISTINA DANIELS has observed him, noting his every move, storing descriptions in her mind. The fly has no clue he’s of such great interest to a writer. The reader gently follows the fly, and wonders about its place in the world. Christina is not into flies; but she takes a trip in to this fly's soul, and then, inspires you to go on that journey. She’s a go-getter, in a gentle, artistic way. The butterfly is romancing the jasmine bud. Senior journalist NIRMALA GOVINDARAJAN has flitted with him, from rose and lily to jasmine, basking in the rendezvous. The butterfly relaxes in the aftermath of the journey. The human race catches a whiff of rose essence, spray of jasmine, and, a fantasy ride to the nether world. Nirmala doesn’t know the butterfly is, in reality, a moth; she believes in wonder. She rides life like a 350 cc bike, and, suggests you to hop on -- vroom. Reviews of "Mind Blogs 1.0 (eBook)"